David Becker/StringerPaul Jacobs is off the Qualcomm board as he seeks to acquire the $US89.7 billion chip manufacturer. Qualcomm will not renominate its former chairman Paul Jacobs to the board of directors, the company announced Friday. Qualcomm also confirmed reports that Jacobs is looking to buy out the publicly traded company, and said it will evaluate the offer if it is made. Jacob’s offer comes days after President Trump blocked a hostile takeover of the company by its Singaporean competitor Broadcom. Qualcomm will not re-nominate its former chair Paul Jacobs to the board of directors when the board meets on March 23, the company announced Friday. Qualcomm also confirmed earlier reporters that Jacobs, its former CEO and chairman, is looking to acquire the company. The Financial Times first reported on Thursday that Jacobs is in talks with global investors, including SoftBank, as he seeks to gain ownership of the $US89.7 billion publicly traded company. 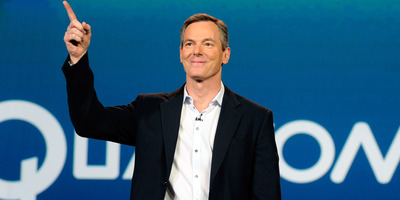 The company said it decided not to renominate Jacobs “following his notification to the Board that he has decided to explore the possibility of making a proposal to acquire Qualcomm.” This is likely to remove any conflict of interest that might occur if Jacobs could participate in both sides of the negotiation process. In response to the board’s decision, Jacobs said “it is unfortunate and disappointing they are attempting to remove me from the board at this time,” while defending his effort to take the company private. “There are clear merits to exploring a path to take the company private in order to maximise the company’s long-term performance, deliver superior value to all stockholders, and bolster a critical contributor to American technology,” he said in a statement. This latest move follows months of drama at the San Diego-based chip manufacturer, which was subject to an executive order by President Donald Trump earlier this week, which prohibited acquisition of the company by its competitor Broadcom, on the grounds of national security. The Singapore-based Broadcom was in the midst of $US117 billion a hostile takeover of the company when Trump issued his order on Monday. Broadcom officially withdrew its offer on Wednesday.